The Azure Functions Runtime preview 2 supports only version 1.x of the Azure Functions runtime. This preview feature is not being updated to support version 2.x of the runtime, and no future updates are planned. If you need to host the Azure Functions runtime outside of Azure, consider using a customer Linux container. Ensure your machine passes the minimum requirements. 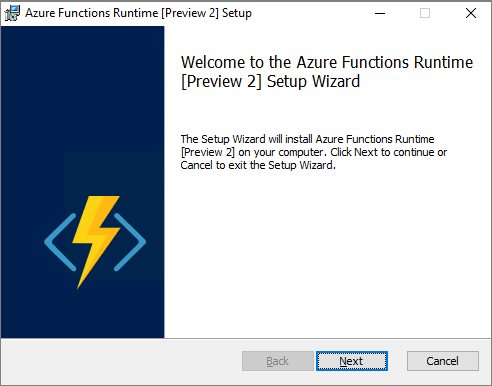 Download the Azure Functions Runtime Preview Installer. Uninstall the Azure Functions Runtime preview 1. Install the Azure Functions Runtime preview 2. Complete the configuration of the Azure Functions Runtime preview 2. A machine running Microsoft Windows Server 2016 or Microsoft Windows 10 Creators Update (Professional or Enterprise Edition). A SQL Server instance running within your network. Minimum edition required is SQL Server Express. If you have previously installed the Azure Functions Runtime preview, you must uninstall before installing the latest release. Uninstall the Azure Functions Runtime preview by removing the program in Add/Remove Programs in Windows. 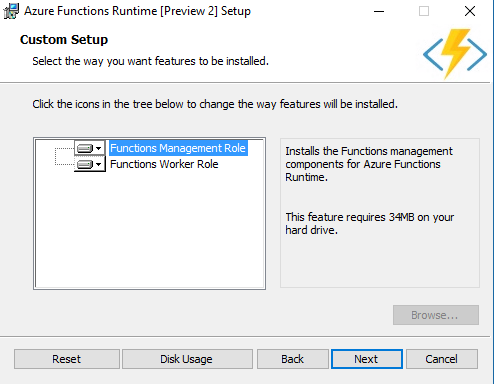 The Azure Functions Runtime Preview Installer guides you through the installation of the Azure Functions Runtime preview Management and Worker Roles. It is possible to install the Management and Worker role on the same machine. However, as you add more function apps, you must deploy more worker roles on additional machines to be able to scale your functions onto multiple workers. Run the Azure Functions Runtime Preview Installer. Once you have read the terms of the EULA, check the box to accept the terms and click Next to advance. Select the roles you want to install on this machine Functions Management Role and/or Functions Worker Role and click Next. You can install the Functions Worker Role on many other machines. To do so, follow these instructions, and only select Functions Worker Role in the installer. Click Next to have the Azure Functions Runtime Setup Wizard begin the installation process on your machine. 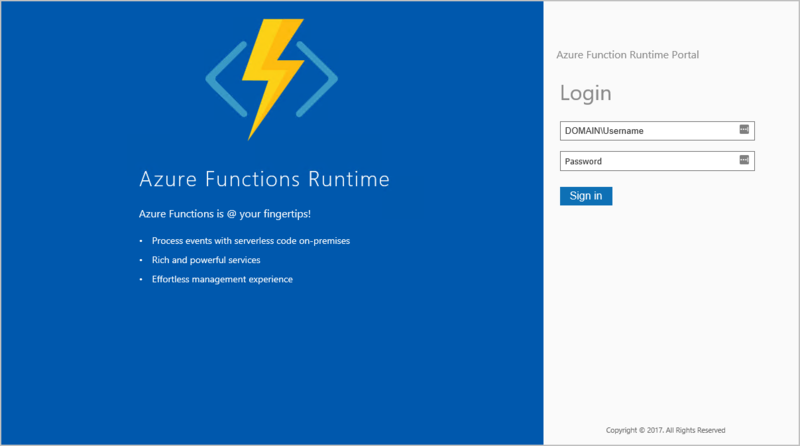 Once complete, the setup wizard launches the Azure Functions Runtime configuration tool. If you are installing on Windows 10 and the Container feature has not been previously enabled, the Azure Functions Runtime Setup prompts you to reboot your machine to complete the install. 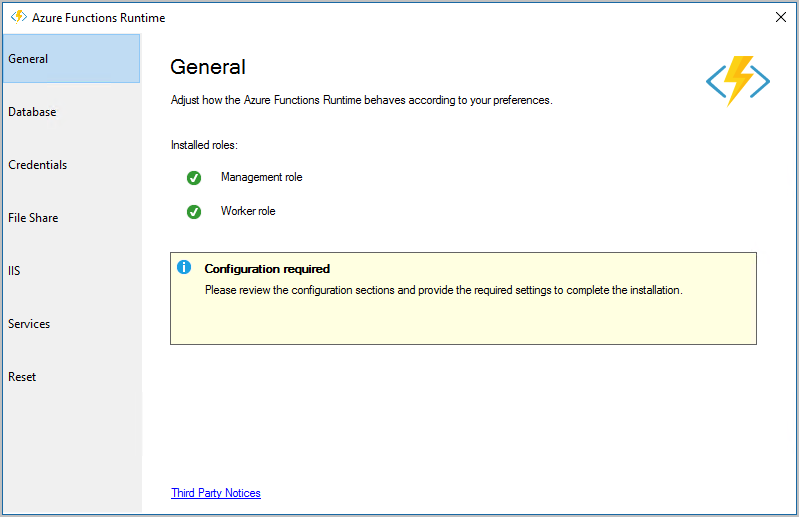 To complete the Azure Functions Runtime installation, you must complete the configuration. The Azure Functions Runtime configuration tool shows which roles are installed on your machine. Click the Database tab, enter the connection details for your SQL Server instance, including specifying a Database master key, and click Apply. 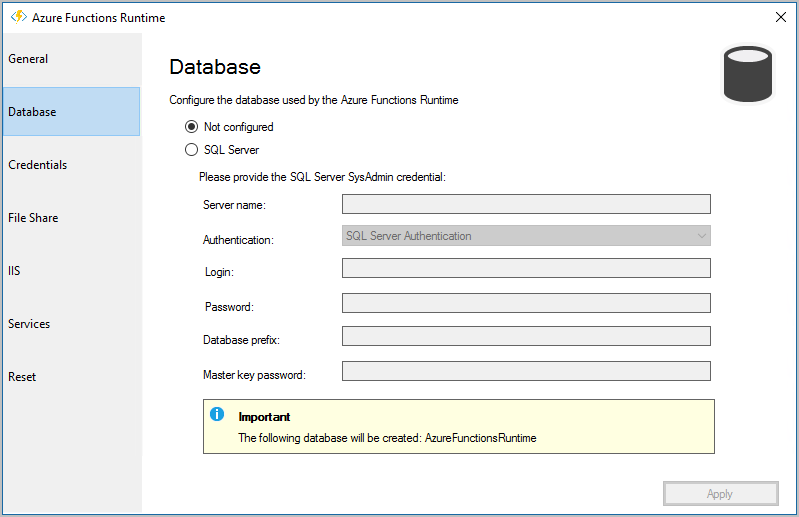 Connectivity to a SQL Server instance is required in order for the Azure Functions Runtime to create a database to support the Runtime. Click the Credentials tab. 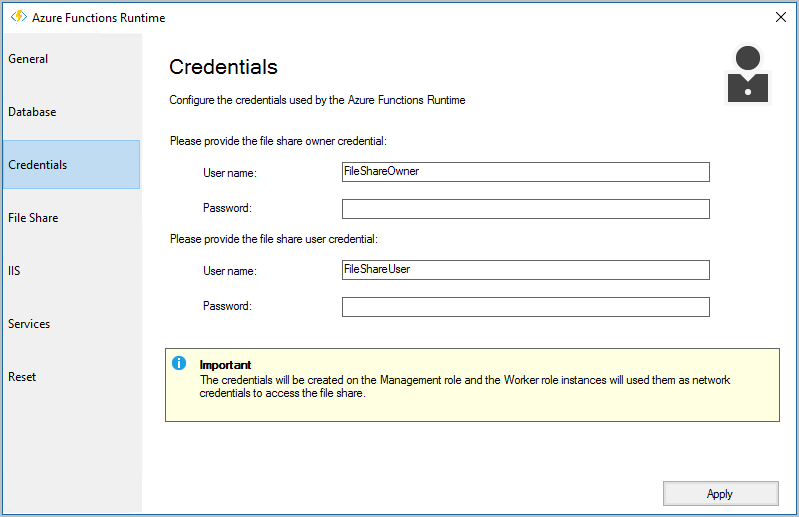 Here, you must create two new credentials for use with a file share for hosting all your function apps. Specify User name and Password combinations for the file share owner and for the file share user, then click Apply. Click the File Share tab. Here you must specify the details of the file share location. The file share can be created for you or you can use an existing File Share and click Apply. 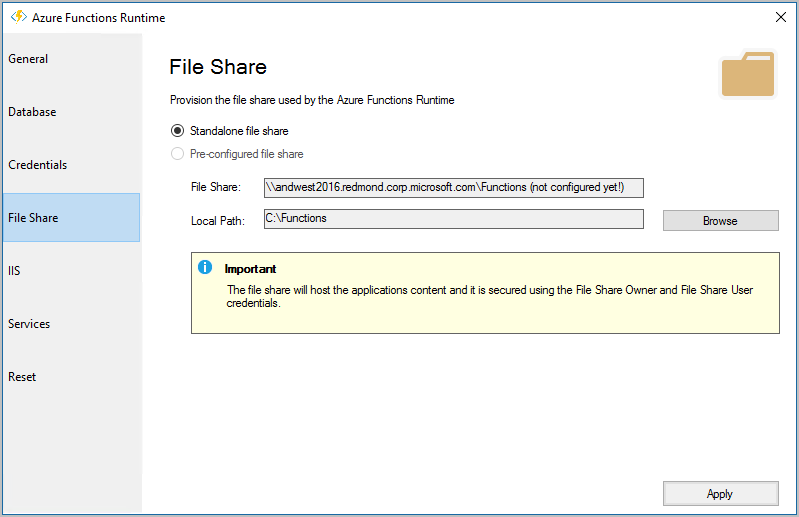 If you select a new File Share location, you must specify a directory for use by the Azure Functions Runtime. Click the IIS tab. 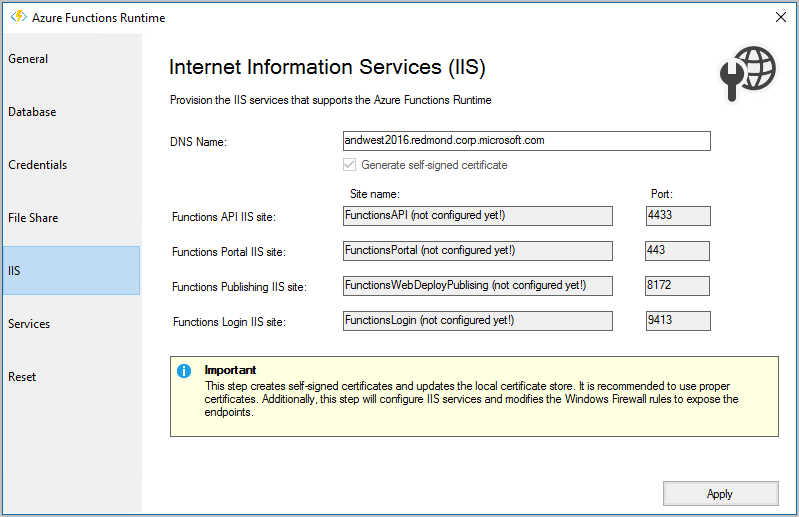 This tab shows the details of the websites in IIS that the Azure Functions Runtime configuration tool creates. You may specify a custom DNS name here for the Azure Functions Runtime preview portal. Click Apply to complete. Click the Services tab. 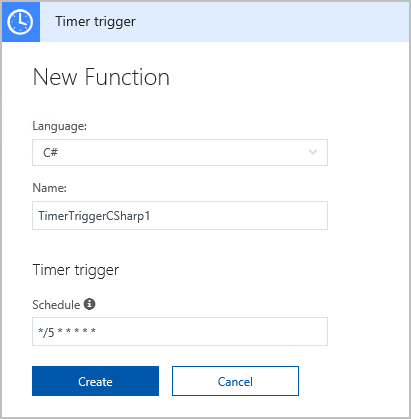 This tab shows the status of the services in your Azure Functions Runtime configuration tool. 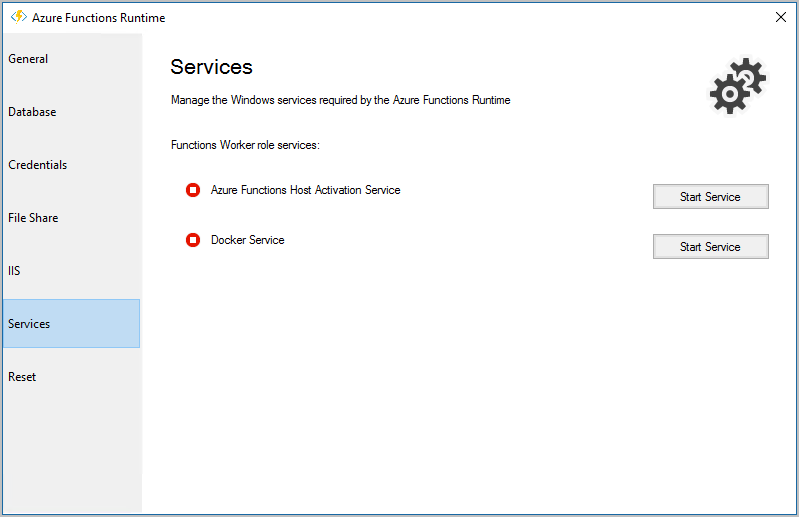 If the Azure Functions Host Activation Service is not running after initial configuration, click Start Service. Browse to the Azure Functions Runtime Portal as https://<machinename>.<domain>/. Browse to the Azure Functions Runtime Portal as https://<machinename>.<domain> for example https://mycomputer.mydomain.com. You are prompted to Log in, if deployed in a domain use your domain account username and password, otherwise use your local account username and password to log in to the portal. To create function apps, you must create a Subscription. In the top left-hand corner of the portal, click the + option next to the subscriptions. Choose DefaultPlan, enter a name for your Subscription, and click Create. All of your function apps are listed in the left-hand pane of the portal. To create a new Function App, select the heading Function Apps and click the + option. Your new function app is listed in the left-hand pane of the portal. Select Functions and then click New Function at the top of the center pane in the portal. Your function has now been created. You can view the execution log of your Function app by expanding the log pane at the bottom of the portal.